Blog>What Size Air Conditioner Do I Need? Thinking about getting an air conditioner? There’s a lot to consider. “What size air conditioner do I need?” is at the top of the list. What brand and style of air conditioner will weigh in as well, but knowing the size of air conditioner your home needs is crucial. Investing in an air conditioner that’s too big won’t just be a waste of money up front when you buy it. An oversized air conditioner will continue to waste money every month as it burns up excess energy needlessly. It might also cycle on and off too frequently and won’t remove humidity from the air as well as it should. This means that with too large an AC unit, you might feel cooler, but the air might feel damp. If you try to play it safe and get too small a unit, you’ll be disappointed in the return on your investment. An air conditioner that’s inadequate for the space won’t be able to supply enough cool air to flow through your home and keep you comfortable. The great news is getting just the right size air conditioner doesn’t have to be a guessing game. Thanks to some helpful new tools and easily accessible information, you can be sure you’re getting the right size air conditioner to keep everyone cool as a cucumber. There are some fairly sophisticated methods that contractors use to find the required tonnage of your air conditioner. These complex calculations take the various factors into account and will give you the most accurate estimate for how many tons your air conditioner must supply. We’ll get to those later. For now, let's start with some basic “rule of thumb” formulas and resources you can go through to find the approximate size you’ll need. So, for this, you would need a 2.5-ton air conditioner. It’s no surprise that you’ll need a heftier air conditioner to convert hot air to cold in the desert and especially warm regions of the U.S.
Another option would be to add in the values of your home’s width, length, height, basic insulation info, and desired temperature adjustment into this BTU calculator. You can also get a pretty good rough idea of the required size of your air conditioning by referring to an air conditioning square footage range by climate zone map. 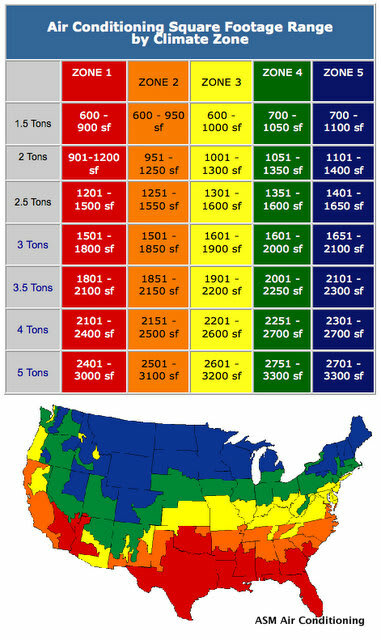 This map breaks the U.S. down into zones that correspond to general guidelines for required AC tonnage. By finding your home’s square footage under the right zone column, you’ll get a quick glance at what size air conditioner you might need. Remember that complex calculation we talked about earlier? For the most accurate and reliable resource on the best size air conditioner for your home, it’s best to get a professional opinion. This is good news anyway since you don’t have to do the math yourself. Check to see if your utility company offers a free energy audit.4 This will give you what is known as a Manual J Calculation for your home. A Manual J Calculation is a complex calculation performed by an HVAC professional to determine the amount of hot air that comes in through exterior walls in warmer months. The calculation takes all contributing factors into account including the thermal characteristics of each wall, window, door, and even flooring and ceilings. This used to be quite the process and took a bit of time to complete. However, new software makes it far easier and less time-consuming. In fact, an HVAC professional can now assimilate all of this home construction information using property tax records that provide information on building code guidelines for your area. Being able to combine all of this data in a program quickly gives the technician a highly accurate Manual J Calculation determining your optimal air conditioner size. Depending on the available tools and record-keeping, a home inspection of one kind or another may be necessary, but won’t be invasive or time-consuming. It’s worth putting in a bit more effort up front to make sure you have an air conditioner that meets your cooling needs without maxing out your energy bill. Read more ideas for keeping your electricity bill low, and how installing solar can help here.